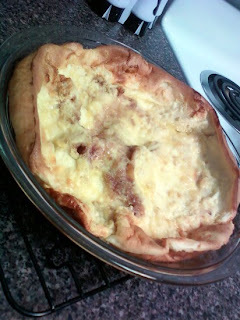 Flour Mayhem: Dutch Baby Pancakes! Preheat oven to 400 degrees. Divide the butter evenly between 2 9 inch cake pans - I used glass pie plates, came out GREAT! Place in the oven until butter is melted, remove. In large bowl whisk together the eggs and the milk. In separate bowl, whisk together the flour, salt, and sugar. 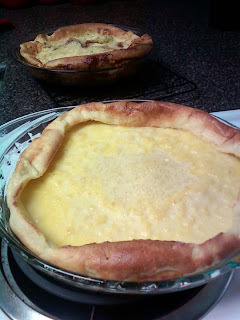 Mix flour into egg mixture. Pour into baking dishes. In small bowl mix small amount of water with raspberry preserves, until syrupy. Drop by spoonfuls onto batter. With butter knife swirl preserves. Bake for 25 minutes until middle is set and sides are golden brown and tall. Transfer to serving plate, serve with desired toppings. I slathered more raspberry preserves over mine, and for the one I didn't put raspberry in I sprinkled with brown sugar. Woah, what a super cool recipe! You are such an amazing baker!! YAY for new Tasha posts! !